The ICA at MECA is pleased to announce the opening of Utopian Benches, a new project by the British sculptor Francis Cape. 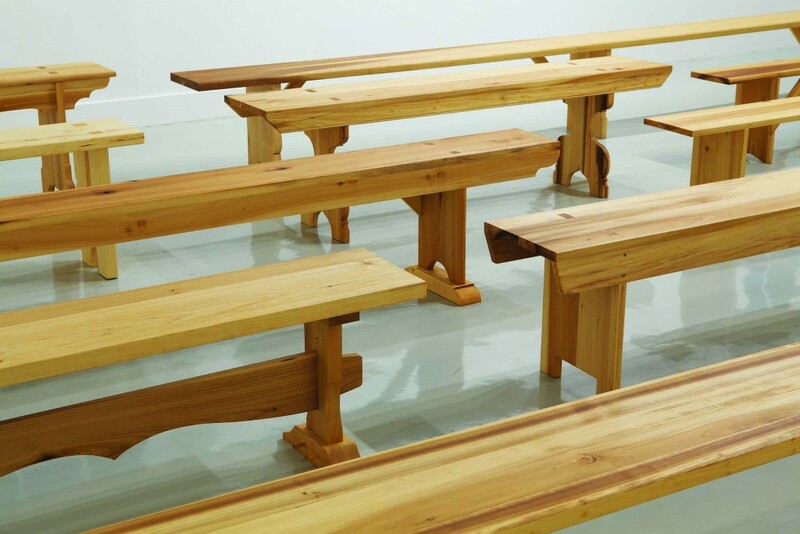 The show, Cape’s first solo exhibition in the Portland area, is comprised of twenty reconstructed benches originally designed for American utopian communities. Cape has remade each seat based on a careful study of available examples and measured drawings, many obtained from his own research. Built from poplar grown near Cape’s studio in Narrowsburg, New York, each unpainted bench suggests a newly minted prototype. To be considered both as contemporary sculpture as well as furniture that can be actively used by gallery visitors, the twenty benches evoke the accumulated aspirations that helped to shape them while inviting collective engagement, speculation, and discourse. The exhibition will be supported by a small, illustrated booklet containing information about each community from which the benches were sourced and available at no charge to visitors. This show is traveling from the Arcadia University Art Gallery, Glenside, PA (November 10 – December 18, 2011). The benches will be traveling to the exhibition We the People, September 8, 2012 – April 7, 2013, at the Tang Museum, Skidmore College.